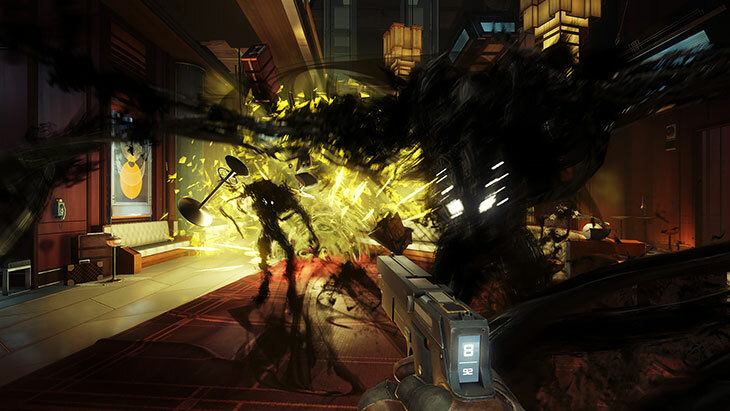 The re-imagined Prey, currently in development for PC and consoles by Arkane, has been revealed during the E3 2016 with a trailer that didn’t show much of the actual experience. A few hours ago, however, Bethesda has released a new trailer for the game, offering the first gameplay look. The new trailer, which can be watched right below, is somewhat on the short side, but it does a very good job in getting fans excited for it with its beautiful environments and glimpses of intense action. Bethesda also showed a Prey demo to QuakeCon attendees, and posted a full rundown on its official website. During the demo presentation, Arkane’s Co-creative Director Raphael Colantonio and Lead Designer Ricardo Bare talked about the game’s mechanics, which will sport some of the signature Arkane elements, such as the ability to chain abilities and more. In signature Arkane fashion, you can chain your abilities. After transforming into the Recycler Charge in the demo, Morgan used the Kinetic Blast power to rocket into the air, reaching an elevated overhang while remaining undetected by the Operators. Kinetic Blast is another of Morgan’s alien powers, learned by studying one of the Phantoms’ methods of attack. It can also be used in combat to push away anything within range while dealing a chunk of damage. At another point we also saw Morgan use an ability called Superthermal to create a fiery proximity trap and deal with a horde of Mimics. Special powers are just one way to take on the many enemies of Prey. Players will also have the option of focusing on a wide variety of tools and weapons. Some of them promise to be quite versatile. Should you choose, you can limit your use of powers and instead focus on the wide variety of tools and weapons you’ll find on Talos I, some of which are repurposed pieces of maintenance equipment. Take the GLOO Cannon: this incredibly versatile tool shoots… well, glue, which instantly hardens, trapping foes where they stand, covering exposed flaming pipes and surging electrical boxes, or providing an interesting new path. We saw both uses in the playthrough, as Morgan examined a group of Mimics trapped in the glue, before eliminating them with a silenced pistol found on the corpse of a fallen security guard. Later, he used the GLOO Cannon to form a makeshift ramp leading to a walkway above his head. Lastly, it’s been confirmed that Prey will feature a crafting system, with players having to gather resources by breaking down items. Prey also has a crafting system, allowing you to create items using resources you gain by breaking down items around the station. Along with weapons and ammo, you can build tools like the Artax Propulsion System at one of the many Fabricators on the station. In the demo, Morgan used this zero g propulsion device to explore the space outside the station. The Artax Propulsion System can be used to quickly access new areas of the station by bypassing the interior and heading straight for an airlock. Prey launches sometime next year on PC, PlayStation 4 and Xbox One.